Younis Khan is a legend. We have known about his legendary status for some time now and have always rated him very highly. You might want to read the following articles along with this piece. Even though he has had some detractors in the past, there are few people now who will not agree with Younis Khan's greatness in International Cricket. Today, in his 90th Test, Younis Khan knocked his 24th test century, which put him level with Mohammad Yousuf, and only 1 behind Inzamam's Pakistan record. During the course of his innings, Younis Khan also went past Yousuf's test runs tally to become the 3rd highest run scorer for Pakistan in tests. It is quite interesting to note the similarity between the stats of Younis and Yousuf. It is really a shame that Yousuf did not play more matches for Pakistan. Politics, as well as, his own selfishness resulted in cutting short his career. Fortunately, Younis has withstood all that, and can do so for another few years before he hangs up his boots. It is also a shame that Pakistan does not play as much test cricket as other countries like Australia, England, and India. One can only wonder where Younis Khan would be if he had played as much test cricket as the likes of Sachin Tendulkar, Ricky Ponting, Jacques Kallis, and Brian Lara. Taking a look at how Younis compares with test batting, you will be surprised to see some of the numbers. Younis Khan is the leading run scorer among all test batsmen who have played 90 tests or less. Younis has not only scored more runs than his contemporaries, but he has also average better than the likes of Hashim Amla, Mike Hussey, and Rohan Kanhai. At the same stage as Younis Khan, i.e. 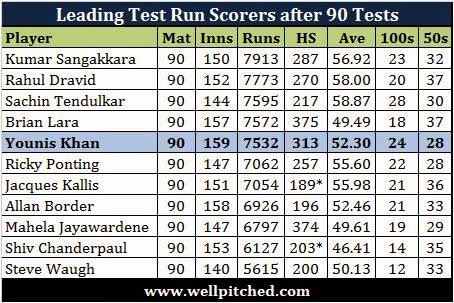 after 90 tests, out of the leading 10 test run scorers, only Sangakkara, Dravid, Sachin, and Lara had scored more runs than Younis Khan. Moreover, only Sachin Tendulkar had knocked more centuries than Younis Khan after 90 tests. After 90 tests, Younis Khan has more runs than Ponting, Kallis, Border, and Waugh had; and more centuries than Sangakkara, Dravid, Lara, Ponting, and Kallis had. Younis Khan has also performed better than the likes of Alastair Cook, Kevin Pietersen, and Michael Clarke, the current generation of batsmen who are expected (or were in the case of KP) to go on and become one of the leading run scorers in test cricket. Younis Khan has scored more runs than Cook, KP, and Clarke had after 90 tests. Younis has also scored the same number of centuries as Cook, and more centuries than KP and Clarke after 90 tests. Younis Khan is 36 on paper, and close to 40 in reality, meaning that he does not have a lot more test cricket left in him. It is such a damn shame that in a 14 year career, he has played only 90 tests, while the likes of Cook, KP, and Clarke, who debuted way after him have gone well past a 100 tests. 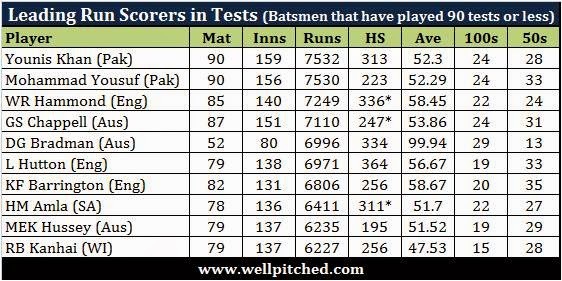 Can you even imagine the amount of runs and centuries that Younis Khan would have scored had he played as much test cricket as any of these other batsmen? I don't think he can get to 10,000 test runs given the little test cricket Pakistan play, but I sure do hope that he plays a 100 tests and goes on to become Pakistan's leading run scorer in test cricket, because if there is anyone who deserves that recognition, it is Younis Khan.